The respective letters of “BOOM” describe how auction services and consignors are evolving wholesale remarketing to transform brick-and-mortar, online opportunities and metrics to deliver more value to both ends of the remarketing stream. Physical auctions continue to serve the wholesale market, but digital disruptors — some from established brick-and-mortar houses — have emphasized to dealers that these online platforms deliver faster results, more choices, better decisioning tools and often better value than had they purchased or sold in the physical lanes. All this to say, digital remarketing tools give both buyer and seller pivotal metrics once unavailable to help them achieve more value from the assets they’re selling or buying at wholesale. These digital tools enable upstream remarketing and other resources that help dealers acquire inventory directly. As a result, some important functions of the auction intermediary are changing. Brick-and-mortar auction facilities and their advisor and recon services still have legs, but online is creating and making possible more opportunities for buyers and sellers to make a profit. Ally’s SmartAuction recently announced an agreement with Nissan Motor Acceptance Corp. and INFINITI Financial Services to list those makes’ off-lease vehicles, Ally announced in a recent press release. SmartAuction is Ally’s online wholesale platform. It lists 30,000 vehicles a day for eligible dealers of all brands. Data — and its practical use, metrics — is driving the digital remarketing boom. Brad Bollman, senior vice president, North American operations, for GM Financial, agreed. “Half of our (off-lease, fleet and rental) vehicles will be sold upstream, and the remainder sold downstream through a network across the two large auction houses and some independents,” he said. In an email from Cox Automotive, manager of economics and industry insights Zo Rahim said off-lease volumes should hit a peak this year. “It’s difficult to pinpoint exactly when we will see the peak in lease maturities returning to market within the year, but it is a reasonable assumption that they will be in the spring months. OEM captives can work with incentives, and their remarketing teams to pull-ahead current leases, so granular forecasting movements is difficult,” he said. “For a few years now, various players in the industry and Wall Street have had negative views of off-lease returns and noted that they would cause a crisis in the used-vehicle market and collapse prices. However, off-lease units did not cause chaos in the used market. In fact, strong retail demand helped support the increased supply, and the market was able to absorb the units,” Rahim wrote. “We measure this by seeing the growth in used sales over the past few years as well as strong price performance in the wholesale market. If off-lease units were not being absorbed, you would have seen inventory growth outperform demand leading to price declines, which we did not see in 2017 or 2018. This ultimately suggested to us that the volumes were being absorbed and will continue to be that way this year so long as demand remains high, which we forecast it will,” Rahim said. For ADESA, about half of its open off-lease volume is remarketed digitally across its DealerBlock Prime online selling platform, said Paul Lips, the company’s chief commercial officer. Last year ADESA launched a dealer-branded mobile auction service to bring auction services to the dealer’s lot or event location. Lips said the company would soon launch a new feature to its online tools and dealer targeted communications that offer tailored inventory suggestions using the dealer’s rooftop-specific purchase history, sales history and price points. “It can tell the dealer whether its vehicles are priced right at auction versus what they’ll be able to retail it for, so we can show them the data so they can concentrate more on the close. Sellers want to sell as fast as possible,” Lips said. The auction services use the data they have amassed to optimize services. “We had a client challenged by their business to improve the bottom line of the business overall, who was working with more than 50 locations across the country,” Capps said, “and by using targeted sales data, we showed how streamlining the number of sites used they could reduce costs and put that vehicle into the right channel to maximize profits. One disruptor getting attention is ACV Auctions, a digital dealer-to-dealer channel. Most interviewees for this report mentioned ACV when we discussed alternative remarketing channels. According to news released by the company at NADA Show 2019 in January, ACV launched in June 2015, and now sells more than 10,000 wholesale vehicles a month on its auction platform, which represents 1 percent of all vehicles sold at auctions today. ACV finished out the year operating in 85 markets coast to coast, up from 30 markets at the start of the year. It plans to be in 140 markets by the end of 2019, it said. “ACV is a 20-minute digital auction,” ACV Auctions chief executive officer George Chamoun told me at NADA while a live ACV auction played out on his smartphone. “Sold” alerts clicked off steadily as he talked. “This auction shows 61 dealers bidding, and already we have 16 bids on this 2010 Mercedes with 100,000 miles. It’s a great car for one dealer, and for another, it’s not the car he or she wants,” Chamoun said. ACV provides online bidders a full vehicle condition report featuring 30 to 60 vehicle photos, including undercarriage and opened fluid reservoirs, so buyers can observe any tale-tell signs of mechanical issues those systems’ fluids might be telegraphing. It also features an engine-running audio app for capturing the sound of a running vehicle engine. The audio is appended to the listing. A trained listener should be able then to detect telltale problems, if any, such as bearing knock, valve sticking or other issues. In all cases, this information enables the bidder to make a more informed decision. Over at KAR Auction Services, the company recently announced upgrades to its TradeRev dealer-to-dealer digital mobile auction application. The upgrade, Move Metal, is designed to do that, faster. In a Feb. 5 news release, KAR said TradeRev shortened its auction timer to increase the velocity of dealer transactions on the platform. Jon Hart is general manager of Escondido Auto Super Center, an independent dealership in Escondido, Calif., that’s been in business since 1994 in the city that’s about 30 miles north of San Diego. The store lists more than 200 vehicles in inventory mostly from domestic and Asian automakers with a few high-line units sprinkled in, too. “I can’t do it anymore now that I buy online. It just wouldn’t work for me anymore,” Hart said. Hart also acknowledged physical auctions contain plenty of vehicles to choose, but the struggles came when searching and securing units at a particular price point and condition. It’s how Escondido Auto Super Center became a source of information for online wholesale companies like CarWave to develop its platform. The owners of Escondido Auto Super Center actually are siblings of CarWave co-founder John Lauer, a former vice president at Microsoft (More on that sibliing connection later). But Hart and Escondido Auto Super Center purchase inventory from an array of online sources. He shared several reasons why. “It’s been much easier to buy online. There’s a lot bigger selection,” Hart said. “You can view so many more cars during the same time that it would take you at a brick and mortar auction because of the convenience. “When you go to a brick-and-mortar auction, you have to look through the list, find the cars the day before, filter through them. You’re up early in the morning,” he said. “You’ve got to physically inspect them on the lot before you bid. That whole process takes a while. “If you’re looking at time per car, it might take 10 minutes or more. Whereas online, you can go through a car in a minute, two at the most, and put in a bid. You can probably look at five times the inventory, if not more, in the same amount of time,” Hart continued. “You end getting better deals because you can look at five times more cars in the same period of time. You can be more selective in the cars you’re purchasing,” he added. And along with convenience, Hart pointed out that condition reports and buy-back guarantees now available through online inventory acquisition channels make being at a desk or using a mobile device much more productive when completing wholesale chores than going through the auction gates and walking the lots and lanes. Granted, not all dealers have the same preferences as Hart. Many are still going to physical auctions, to put it lightly. According to statistics the National Auto Auction Association provided in spring 2018, just over 10 million vehicles were sold at NAAA-member auctions in 2017, which was up 2.5 percent over 2016 and represented $105.6 billion in sales, according to the association’s annual survey shared last year. That $105.6 billion in gross value of units sold was up from $100 billion in 2016. There were 17.32 million vehicles that entered the auction in 2017, compared to 17.74 million a year earlier. The percent sold climbed from 55.1 percent to 57.8 percent. Average price per unit was up 3 percent at $10,544. But, still, alternative options have emerged, including the online wholesale platform CarWave, referenced above. It was on a 2009 trip to California, where Lauer was visiting one of his brothers, that the wheels starting turning for an idea that eventually became what is now known as CarWave. Lauer’s youngest brothers, Joe and Bill, had founded the independent dealership known as Escondido Auto Super Center in 1994. In looking for resources to buy inventory, his brothers had built relationships with franchise dealerships, eventually doing some of the wholesaling work for those stores, John Lauer said. The company began by tackling the problem of aged frontline inventory for franchised dealerships in California, Lauer said. That beget the TheDealersForum.com, a network for franchised dealers to transact. “They really need other used-car managers who might need to fill a hole in their inventory, and therefore, they’ll buy it from another reputable franchised dealership, knowing that they can just bring the car to their lot, change the stickers on the outside, and the car should be pretty much ready for sale,” he said. “So that was a real pain point. They were having difficulty doing that,” Lauer said. The focus for the company became selling that aged frontline inventory for the next three-and-a-half years. But they recognized the difficulty that scaling nationally could bring, given that some areas might not have as much aged frontline inventory as California, Lauer said. Wanting to find another way to help franchised dealers, the company began to look at helping franchised dealers sell trade-ins. Thus, the emergence of MyFreshTrades.com, an online auction where franchised dealers sold trade-ins to independent dealers. It launched its first online auction on the trade-in side in 2014. Fast forward to February, and those two tentacles of the business — MyFreshTrades.com and TheDealersForum.com — were rebranded as one: CarWave. All the vehicles in the CarWave platform are from franchised dealers and are bought by either other franchised dealers or independent dealers. With plans to expand elsewhere in the West, CarWave has been operating in California, where it works with 1,000 franchised dealership and sold 35,000 vehicles last year. There are numerous and quite successful players in the online wholesale segment of the market, a segment that appears to be growing. Asked what he thinks is driving the growth, Lauer pointed to margin compression, at least on the buyer side. Because of the growth of the automotive Internet in the last 15 years, especially the last six to eight years, “There’s so much more transparency in buying vehicles on the consumer side,” including pricing, he said. That level of transparency driven by the Internet, as in many other sectors outside of auto, has pushed down margins for car dealers. The second factor Lauer noted was just the convenience of online shopping, which began in other industries but has “finally moved into the wholesaling of automobiles” — a movement that has been spurred in part strong condition reports. Additionally, for dealers on the buying side, it can be “costly” for them to be away from their stores, he said, for a number of reasons. As far as next steps for CarWave, it has recently rolled out into Arizona, hiring inspectors and a sales team there. It is currently hiring in Nevada and likely will be launching there by the end of March. Moving to the Pacific Northwest, CarWave plans on launching in Oregon and Washington in the second half of 2019. Lauer recently joined the Auto Remarketing Podcast. That episode can be found below. UPDATE: This story has been corrected to reflect the correct number of auction partners (23). The list of partners in the portfolio of Auction Management Solutions (AMS) is now up to nearly two dozen. According to a news release distributed on Monday, AMS has added Skipco Auto Auction, located in Canal Fulton, Ohio, to its growing portfolio of partners to help assist with business consulting and development. Founded in 1978 by Robert Blowers, Skipco is one of Ohio’s premier auto auction with Saturday sales open to automotive retailers throughout the region. The operation has grown to become a facility that includes 12,000 square feet and running four lanes. In addition to cars and trucks, the auction sales also include motorcycles, ATVs, boats, camper, RVs and powersports equipment. “We are pleased welcome Skipco’s team to the AMS family,” AMS president Tom Stewart said. “Their longevity in the industry and their financial success means they have solid foundation on which to build. As more national and regional consignors learn about the full range of services Skipco offers, growth will occur quickly. “AMS was created with a focus of partnering with independent auctions to assist in growing their business, helping them maximize their footprint in the market, and increase overall profitability. We feel that Skipco Auto Auction will be a great addition to our group,” Stewart said. For more information, visit AMS at auctionmgt.com or Skipco Auto Auction at www.skipco.com. Copart’s acquisition of Vincent Auto Solutions in Greenville, Ky., adds a “strong local management team with long-standing customer relationships," Copart chief executive officer Jay Adair said in a news release. Adair added that the acquisition is part of Copart’s overall expansion initiative that helps the company process its increasing volume in Kentucky and nationwide. Copart operates at more than 200 locations in 11 countries, with more than 125,000 vehicles available online every day. "We are excited to be part of the Copart family and its network of facilities and to enhance Copart's presence in the western Kentucky region," Copart general manager Brody Vincent stated in a news release. Vincent is a former partner of Vincent Auto Solutions. The acquisition follows additional Copart activity as of late. The company recently made five announcements of new facilities or expanding an existing operation. It most recently enhanced capacity at its Newburgh, N.Y., location, adding 25 acres of storage space to its existing 68 acres. David Vignes, who is president of remarketing services at KAR Auction Services, believes that if you asked all 18,000 employees at KAR Auction Services, “Who is Jim Hallett?” most would correctly say that Hallett is chief executive officer and chairman of the company. “But I can guarantee you that absolutely everybody knows Safe T. Sam,” Vignes said in an interview with Auto Remarketing. As many people in the auction industry know, Safe T. Sam is the animated mascot of ADESA’s safety program, which is a course of short instructional videos that Vignes created. Now more than 75,000 people have been certified or recertified in auction safety through the program. Vignes’ work on the program led to the National Auto Auction Association naming him as a Warren Young Fellow in February. The association also named Cox Automotive safety and environmental senior director Kenny Jones as a Warren Young Fellow at an awards ceremony that took place during the association's Safety Summit in Dallas. NAAA stated in a news release that the honor recognizes Vignes’ and Jones’ instrumental roles in developing and promoting safety initiatives for the auto auction industry. As part of the award, the association presented a $2,500 donation each in Vignes’ and Jones’ names to NAAA’s nonprofit Warren Young, Sr., Scholastic Foundation. A Fellow is a donor at that level, or someone in whose honor or memory a contribution is made in that amount to support the scholarship organization. Vignes, Jones, and 111 others have now earned the lifetime distinction of being named a Fellow. They received a gold medal and a framed commemorative certificate. Their names will be engraved on a plaque of esteemed Fellows at NAAA headquarters. The foundation was established in 2004 and has raised more than $2.3 million by awarding $52,000 in merit scholarships annually for full-time study at accredited institutions. The award was named in honor of Warren Young, Sr., who NAAA describes as a pioneer of the auto auction industry who retired after 35 years of service to his profession and NAAA. A driver training program was one of Jones’ many safety initiatives, Bailey said, adding that the training program led to NAAA’s initial educational video, “Cycle of Safety.” It also led to safety leadership instruction and safety process evaluations, Bailey said. Jones also oversaw a campaign in 2018 that resulted in all Manheim auto auctions becoming 100-percent safety certified, according to a news release. “The course of short instructional videos has become the industry standard and, thanks to KAR generously making it available free to all our members, more than 75,000 people have been certified or recertified in auction safety,” Bailey said. Commenting further about Vignes’ work on the Safe T. Sam program, NAAA stated that as Vignes’ cartoon image began branding the safety program’s materials, Vignes worked to increase the program’s impact by having Safe T. Sam make personal appearances at auctions. Vignes dressed as the character and toured the auctions. His visits began to go viral on social media, spreading the message of safer auctions. “Vignes had a mascot costume made, and Safe T. Sam was born,” NAAA stated in a news release. 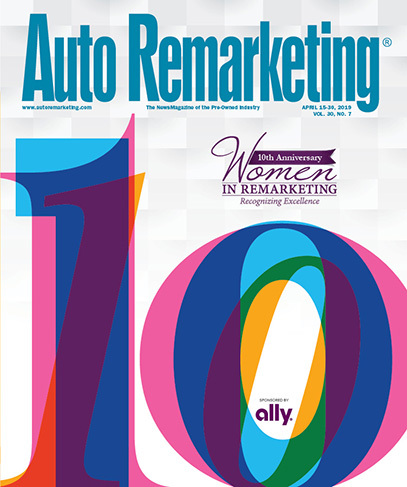 KAR eventually provided the program for free to all our members, “because we believe it’s the right thing to do,” Vignes told Auto Remarketing. There is a dealer group that acquires inventory through KAR Auction Services, and there is not a manager nodding to a ringman in the lanes or hitting the buy button on a mobile device. No, there’s not a ghost or a hologram getting sedans, utilities and trucks for this dealer body. KAR executive vice president and chief financial officer Eric Loughmiller explained what’s happening as the wholesale market continues to evolve far away from the times when the only path dealers could take to secure inventory took spending multiple days away from their showrooms, walking lots, kicking tires and consuming vast amounts of caffeine and salted meat. “A dealer group, they give us parameters and algorithms. They don’t have people doing it,” Loughmiller told Auto Remarketing during a recent phone conversation. “We purchase cars at their direction without them being on site at the auction. Using data and analytics combined with the artificial intelligence, they can bid without having a person in the lane. “All of this is put together through the digital footprint that we’ve created,” Loughmiller continued. Having a digital footprint larger than a lot that can contain more than 10,000 vehicles is center in the technological crosshairs of KAR chairman and chief executive officer Jim Hallett, who also shared his perspectives during the conversation with Auto Remarketing. Hallett and Loughmiller were fresh off KAR’s quarterly conference call with the investment community when the top company leaders discussed their financial statement along with the challenges it’s enduring to get TradeRev a greater toehold in the digital wholesale space. “The biggest thing is we’re definitely an industry that’s going through a digital transformation, and we are very much positioning KAR to stay ahead of that curve by making sure we have the right assets that can manage the business and make sure we can do business the way our customers want to do business,” Hallett said. “We don’t want to be a follower, and we will absolutely lead this change,” he continued. In light of all of this change involving things such as algorithms, Loughmiller responded when asked what if an array of employees — from field representatives to lot attendants — were questioned about the current state of KAR. “They probably have a little anxiety around what’s happening in this Internet world,” Loughmiller said. The financial report KAR shared articulated many of those positives, especially in the online world. At ADESA, the division sold 3,472,000 units in 2018, representing a 9-percent lift year-over-year. Of that figure, the company said 1,304,000 units were online-only transactions, signaling a 39-percent spike year-over-year. The movement shifted ADESA’s total online volume from 46 percent of total in 2017 to 54 percent in 2018. Back in 2014, the company sold 495,000 units online, representing 38 percent of its total volume. KAR did point out that online revenue per unit at ADESA is a fraction of what it is when the vehicle goes through the physical sale — $121 versus $844 — respectively. Hallett acknowledged that he’s often questioned about why he’s so enthusiastic for cars selling on the online platform, even though the revenue currently is much smaller. “The answer is simple: We don’t care where the car sells. We just want the car, and we want to sell the car. The economics and the margins will take care of themselves,” Hallett said. And with KAR handling more sheer volume, the company is also seeing growth in other aspects of its business such as vehicle reconditioning as well as the funding resources available through Automotive Finance Corp.
“They’re using our services more than they have probably in the last 10 years,” Loughmiller said. In company news separately announced from its quarterly financial report, KAR revealed a six managerial adjustments. ADESA announced Lawrence Cubitt has been named regional vice president of the ADESA West region. KAR highlighted that Cubitt brings decades of auction leadership and deep customer relationship experience to the role. “Lawrence is a proven leader who is well-respected by employees, customers and colleagues,”, ADESA chief operating officer Srisu Subrahmanyam said in a news release. Cubitt began his remarketing career more than 20 years ago as remarketing manager for a rental car company in Detroit. For the past 14 years, Cubitt has served as general manager at ADESA Flint, where he has grown the customer base. During his tenure, he has integrated services, technology and innovation that have streamlined the auction process and enhanced the customer experience. The search for a new ADESA Flint general manager is on-going, according to the company. • Jay Hinchman has been named general manager of ADESA Las Vegas. Hinchman has stepped down from his role as regional vice president of the ADESA West region to spend more time with his family and continue his 11-year career at ADESA. He joined ADESA in 2008 and served as general manager at ADESA New Jersey before assuming the general manager role at ADESA Las Vegas in 2014. • Ed Burton has been named general manager of ADESA Birmingham. Burton joined ADESA in 2013 as general sales manager at ADESA Washington D.C. and has been influential in integrating TradeRev as the digital auction leader in the market. He brings 25 years of automotive industry experience to his new role. • Chris Beyer has been named general manager of ADESA Little Rock. Beyer began his career at ADESA in January of last year as assistant general manager of ADESA Little Rock. With 18 years of automotive industry experience, Beyer replaces Angela Sims, who retired at the end of last year. • Todd Hoagey has been named general manager of ADESA Orlando. Hoagey brings 23 years of remarketing experience to his new role. He most recently served as chief executive officer of Auction Direct USA Used Vehicle Superstore, a company Hoagey co-founded in 2005. • Mike DeForest has been named general manager of ADESA Tulsa. DeForest was previously general manager of ADESA Mercer. He brings 20 years of management experience to the role. Chris Angelicchio, general manager of ADESA Pittsburgh, has also assumed the responsibility for ADESA Mercer and is now the general manager for ADESA Pittsburgh/Mercer markets. Like initiatives put in motion by the National Automobile Dealers Association and Asbury Automotive Group, KAR is also looking to keep its locations stocked with a quality workforce capability of smoothing out dents and dings or installing brakes and tires. “I like to say that the mechanics and the body shop technicians went away with the horse and buggy. They're a dying breed like the shoemaker and the tailor,” Hallett said during the conversation with Auto Remarketing. Hallett added another point that might be quite enticing. “The other thing is these are good paying jobs,” he said. “We’ve got to get out to kids that a four-year degree isn't for everyone. Sometimes a two-year associate degree in the specialty trades is going to provide you with a better opportunity and future and a good paying job. “I think demand will continue to rise as we see more and more mobility fleets come in. I think people are going to see the opportunity, and it’s up to us to broadcast that through our dealer partners and our OEM partners and bring it to our auctions,” Hallett went on to say. Loughmiller emphasized that KAR is “well positioned from a capital structure perspective.” The company reported that it closed 2018 with $337 million in cash and cash equivalents as its total assets surpassed $7.2 billion. Loughmiller explained the beneficial moves the company made before the Federal Reserve adjusted interest rates multiple times last year. “In 2017, we were successful in refinancing our term Loan B as well as issuing $950 million in fixed rate bonds at 5 1/8 percent interest with an 8-year term. What that did is it protected us against some of what is happening now, so a substantial amount of our debt is fixed rate,” Loughmiller said. “The remaining portion of our debt, which is about $1.5 billion in round numbers, while it’s floating rate debt, we’ve got $1.2 billion in interest rate caps, which by the way have been in the money since the middle of 2018, so we were able to fix interest rates, a portion through March and a portion through August. We’re very well positioned to ride through some of the uncertainty around interest rates right now,” he continued. “Long term, we’ve been in successful in finding ways to protect ourselves against increasing interest rates. It might come with a little more cost later this year than it did a couple of years ago, but we’re comfortable that we’ll have no issues,” Loughmiller went on to say.